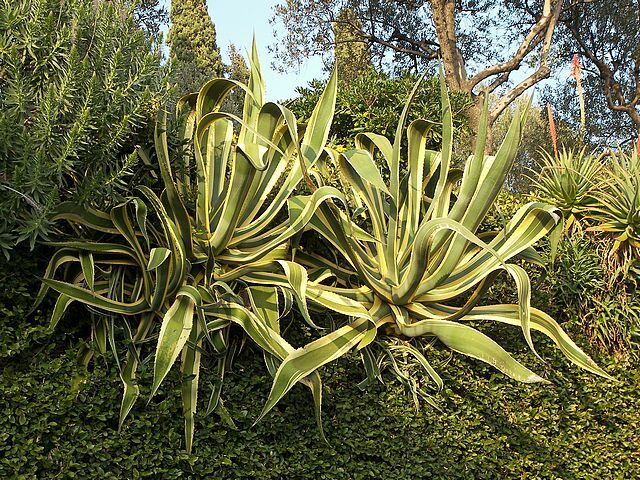 Plants from the Agave family hold some of the most impressive succulents on the planet, and luckily for us, most agaves are relatively easy to grow. Indigenous to Mexico, agaves are also native to the southern and western United States and central and tropical South America. They are succulents with a large rosette of thick, fleshy leaves, each ending generally in a sharp point and with a spiny margin; the stout stem is usually short, the leaves apparently springing from the root. Spanish and Portuguese explorers probably brought agave plants back to Europe around the middle of the 16th century, but the plants didn't became popular in Europe until the 19th century when more unusual varieties began to be imported by collectors. Some have been continuously propagated by offset since then, and do not consistently resemble any species known in the wild, although this may simply be due to the differences in growing conditions in Europe. One of the most familiar species is Agave americana, a native of tropical America. Common names include century plant, maguey (in Mexico), or American aloe (it is not, however, closely related to the genus Aloe). The name "century plant" refers to the long time the plant takes to flower. The number of years before flowering occurs depends on the vigour of the individual plant, the richness of the soil, and the climate; during these years the plant is storing in its fleshy leaves the nourishment required for the effort of flowering. 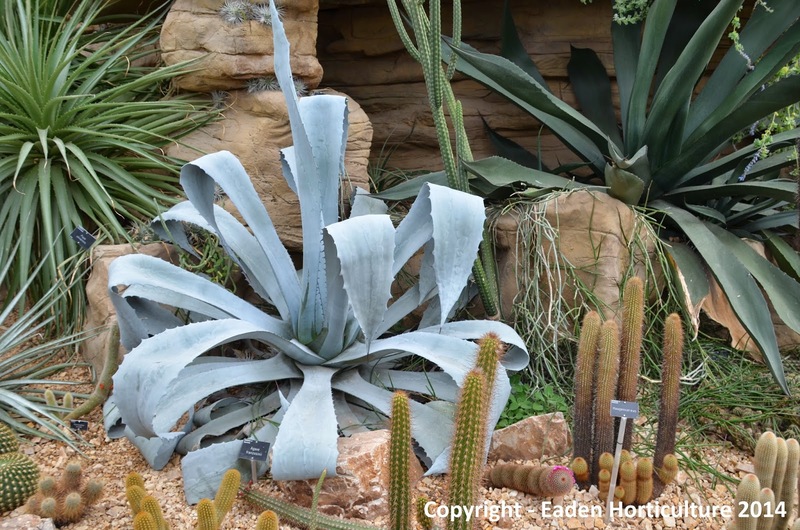 Agave americana is now widely cultivated as an ornamental. In its variegated forms, the leaf has a white or yellow marginal or central stripe. As the leaves unfold from the centre of the rosette, the impression of the marginal spines is conspicuous on the still erect younger leaves. The plants require protection from frost. They mature very slowly and die after flowering, but are easily propagated by the offsets from the base of the stem. Blue A. americana occurs in abundance in the Karoo, and arid highland regions of South Africa. Introduced by the British settlers in 1820, the plant was originally cultivated and used as emergency feed for livestock. Today it is used mainly for the production of syrup and sugar. Because agaves are relatively slow growing they can be expensive to purchase, so propagating your own agaves is a fantastic way of building up your stocks as well as getting the varieties that you want. Luckily, the majority of agave species and cultivars will reproduce quite readily from suckers appearing from the base of the parent plant, and some even produce bulbils on the inflorescence (flowering stems). The seeds actually germinate and grow while still attached to the flower stalk! 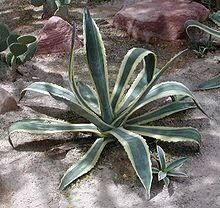 Another, but rather more drastic way of getting agaves to reproduce, is to remove the centre of the adult plants. Just as with cacti, this stimulates the plant to produce multiple heads, each of which can then be rooted. Unfortunately, all of these methods of reproduction have disadvantages. For example, not all plants produce clones - some of the most beautiful such as A. Victoriae-reginae and A. ocahui rarely ever do, and even for those that will, the offsets may be poorly shaped or attached too tightly to allow separation from the parent without injury. Furthermore, the offset may contain diseases passed on from the parent. Reproduction by means of bulbils gives you many plants in a hurry, but this tends to be a rare event and characteristic of just certain species. 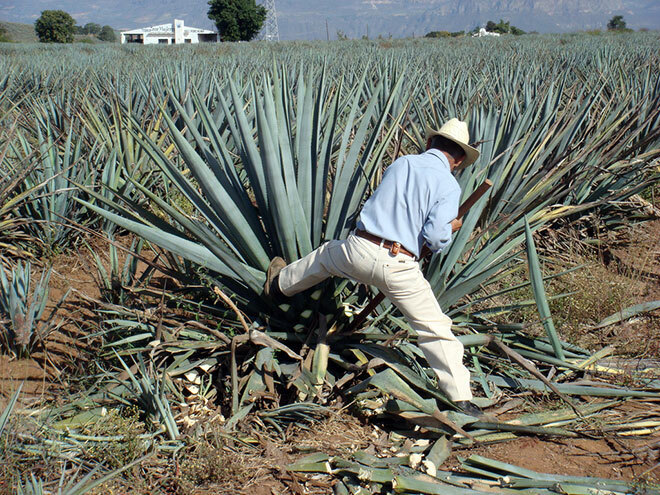 Perhaps the best way to reproduce agaves is to grow them from seed. Agave seeds are flat - usually - and black in colour. They can also vary considerably in size, usually reflecting the size of the mature plant. As with most plants, the fresher the seeds, the greater the percentage of germination.